I bought the cheapest three-shelf bookcase I could find this afternoon and hastily assembled it before piano lessons. I pinterested it a little, modpodging some sheet music wrapping paper I had picked up last year to the backing. As I attached the backing, however, the entire unit was slightly askew, making the backing crooked. 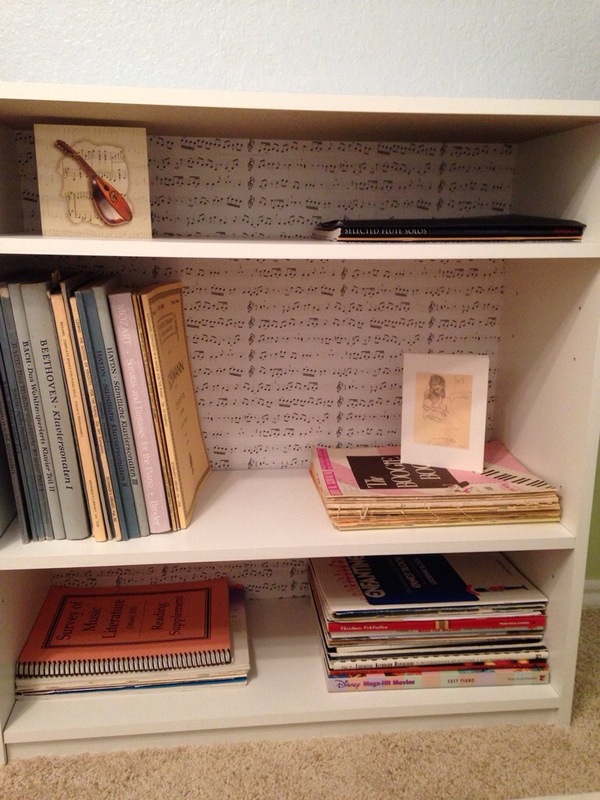 Not only did the bookcase sit slightly awry, but the sheet music was most definitely slanted. I couldn’t live with it. Nor could I even wait until tomorrow. So while my children were getting ready for bed I pulled apart a piece of cheap furniture which, once assembled should never be disassembled. I made a slight mess of things and had a few moments when I regretted my decision. Why couldn’t I just accept the imperfection? I happened to be texting my smart friend Rachel as I did this. My afternoon with the bookcase was a literal metaphor for her afternoon. We commiserated that we can both forgive others or even not even see their flaws at all, but our own? They are massive and glaring. There is no ignoring or forgiving our own. I would not rest. Fortunately before I passed the point of no return I discovered my error, caused by the thick pile of the carpet. I was parenting from the other room at this point so I stopped to tuck the boys in. I did it. I fixed it. This won’t do at all. It does nothing to reduce my delusions of grandeur. This is not the disaster it was supposed to be. Heaven help us, all I can find is one tiny flaw. Two flaws, actually, because I also need more music. I think I’ve got boxes of music at Mum’s, but who knows when I’ll get those? I have pinned an entry way table where the entire thing is modpodged in music. I love it and I can’t wait to do something like it. I would have done the backing askew on purpose so I wouldn’t have to worry about it being perfect. That’s what I do to keep my sanity. It’s true about accepting flaws, however. I am so okay with the flaws in others (if I even notice them!) but I am SO hard on myself. I know I need to learn to be more accepting of myself. That’s a hard battle.